We start with a premium quality, 100% cotton fiber base and then transparentize it using our proprietary process. This patented process uses no Volatile Organic Compounds. Comstock Vellum has a special engineered surface that accepts ink uniformly and achieves the greatest possible density without pooling or running. Excellent line quality is achieved with no feathering. 20 lb. 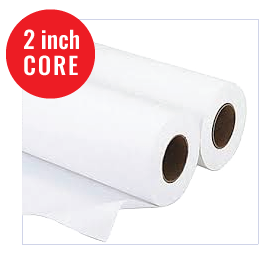 CAD Inkjet Vellum RollsFor non-archival purposes, our smooth, translucent bond is great for printing test prints. And for production of intermediates for diazo reproduction from your inkjet plotter.